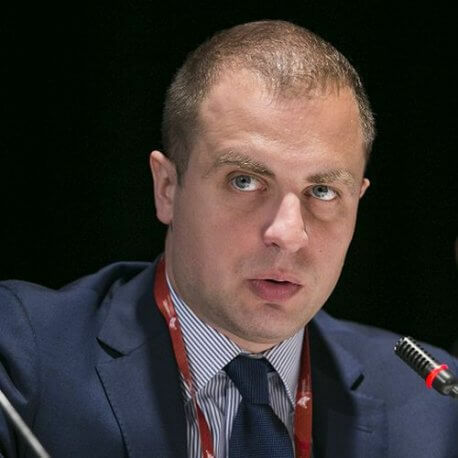 Tomasz Szatkowski is a lawyer who is an Undersecretary of State in the Ministry of National Defense. He completed post-graduate studies in the field of national security at the University of Warsaw and war studies at King’s College London. He also completed a postgraduate course in intelligence policy at King’s College London, a training course of development for staff officers at the Graduate School of the United States Navy in Monterey, and a course of programming defense policy and strategic management at the Defense Academy of the United Kingdom. Minister Szatkowski was awarded scholarships by the Ministry of National Defense of the United Kingdom (2004), the U.S. Department of State (2007), and was named an Asmus Policy Entrepreneurs Fellow of the German Marshall Fund of the United States (2013). He has a long and varied experience in national security, especially defense policy and armaments as well as the supervision of special services and public media. This expertise was acquired in his tenure in crucial national positions at the Sejm, the Chancellery of the Prime Minister, and within the defense industry, public media, European Parliament and NGO’s sector. Minister Szatkowski is the author of many publications on the aforementioned issues, published both in Poland and abroad. His interests are focused around strategic studies, classical military strategy, in particular the relations between technology and strategy, intelligence strategies, and defense economics, as well as problems of national security policy coordination. In the years 2015-2016 Minister Szatkowski was assigned by the Minister of National Defense Mr. Antoni Macierewicz as a person responsible for preparing Polish position for the NATO Warsaw Summit. After that Minister Szatkowski has led the Strategic Defense Review which has been finished in May 2017.